Bal Mandir was conceived by Anuben as a sanctuary for children, where they would be cared for in a safe and stimulating surrounding. The services provided here are fee and teachers trained at Montessori Schools carry out interactive programs like arts and crafts, painting, storytelling and singing for children to encourage emotional, physical, and social development. The teaching structure is designed on monthly themes to guide the children to master important skills that they will need for life. Admission to day care are open for children between the age of six months to five years, and specially for children whose parents work during the day or are unable to take care of babies. This service is provided free. 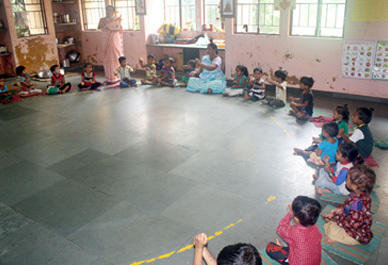 Nearly 500 children are taken care of in 16 such Day Care Centers. Medical care & Vaccination programs are conducted regularly for children. 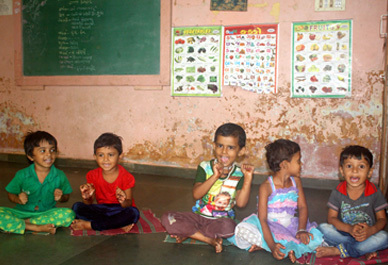 Free Nutritive food with prescribed calorie intake for proper physical and mental development of children. One to One Meeting with parents to discuss their children's future and development. Workshops for parents to make them aware about children's growth, better educational and medical care of the children.